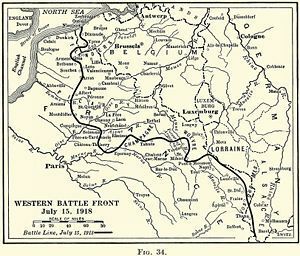 The Third Battle of the Aisne (French: 3e Bataille de L'Aisne) was a battle of the German Spring Offensive during World War I that focused on capturing the Chemin des Dames Ridge before the American Expeditionary Force could arrive completely in France. It was one of a series of desperate offensives, known as the Kaiserschlacht, launched by the Germans in the spring and summer of 1918. The American Buffalo Soldiers of the 92nd Infantry Division (United States) and the 93rd Infantry Division (United States) were the first Americans to fight in France, albeit detached from the AEF and under French command. The 92nd & 93rd would continue to fight under French command for the duration of the war. 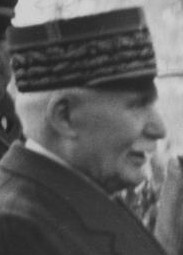 The crisis led to the appointment of Ferdinand Foch as Allied Generalissimo, initially with powers to co-ordinate and deploy Allied reserves where he saw fit. The third offensive, "Blücher" in May 1918, saw major German advances on the Aisne, as the French Army Commander (Humbert) had ignored Pétain's instructions to defend in depth, and had instead allowed his men to be hit by the initial massive German bombardment.